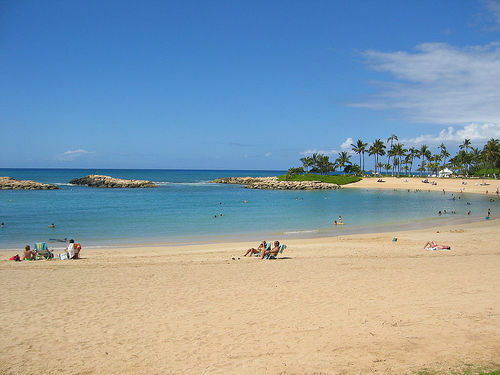 Koolina beach park is Located in the Ko’olina Resort Area, these four man-made lagoons are perfect for swimming at any time of the year. Rock barriers provide protection from the ocean and high surf. The lagoons are sandy beaches surrounded by grass and shaded picnic areas. The lagoons are named: Kolola, Hanu, Nai’a, and Ulua. Koolina is actually a series of man-made lagoons created on the West shore to support the proposed luxury hotels that were supposed to be built there. The lagoons are unfinished but they still are decent beaches and have picnic areas. If you came all the way to Hawaii, why bother with a man-made beach? 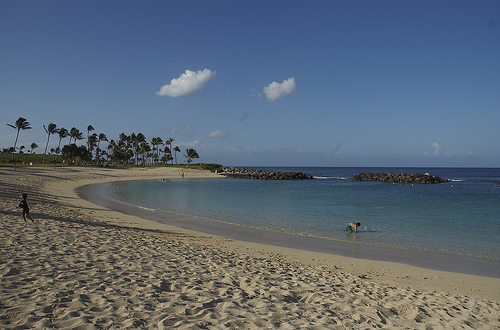 Koolina Beach Park OCEAN INFORMATION — For a detailed description of the Pacific Ocean’s marine climate, water properties, currents, tides, waves, etc., please visit The Ocean Atlas of Hawaii online. You’ll learn many interesting facts, like our average surface water temperature in Winter is 75 F (24 C) and 81 F (27 C)in the Summer.Call 596-SURF (that’s 596-7873) to hear a recorded message on conditions at various O`ahu beaches. The recording is a free service of the Surf News Network (SNN) and is updated four times a day, 365 days a year, at 7 a.m., noon, 3 p.m. and 7 p.m. In addition to wave heights, SNN provides information on winds, tides, and buoy readings.